A writer sometimes crosses your path who is a kindred spirit, whose work challenges your worldview and broadens it and gives you spiritual nourishment and golden hours of writing, reading, and conversations with friends about his theology, novels, and literary legacy. The writer makes you a more compassionate person, a better man and better writer, and gives you greater appreciation for music, literature, art, living out your faith, and connecting with people of different worldviews. That has been my experience with the Scottish fantasy writer, preacher, poet, and mystic George MacDonald. My favorite writer, C. S. Lewis, led me to MacDonald’s work years ago, for which I will be forever thankful. Years later, both writers would give me the courage to write about how I survived an attempted suicide, converted from agnosticism to Christianity, showed me that art transcends a sacred and secular either/ or, and how I found a passion for writing, literature, and art. My book Surprised by Agape was published by Mr. Grant Hudson, president of Clarendon House Publications in Sheffield, England, and endorsed by my friend and C. S. Lewis scholar Dr. Don King, my friend Dr. Carolyn Curtis, editor of the book Women and C. S. Lewis, and my friend, the Scotsman, David Jack, translator of the Scottish novels of George MacDonald into English. I first connected with David years ago through the George MacDonald Society page on Facebook (it is amazing what can happen through social media!). David and I would correspond about our interest in the writings of MacDonald, Lewis, J. R. R. Tolkien, Madeleine L’Engle, G. K. Chesterton, Jane Austen, Charlotte Bronte, Charles Dickens, other writers, and our interest in music, film, faith, and life experience. 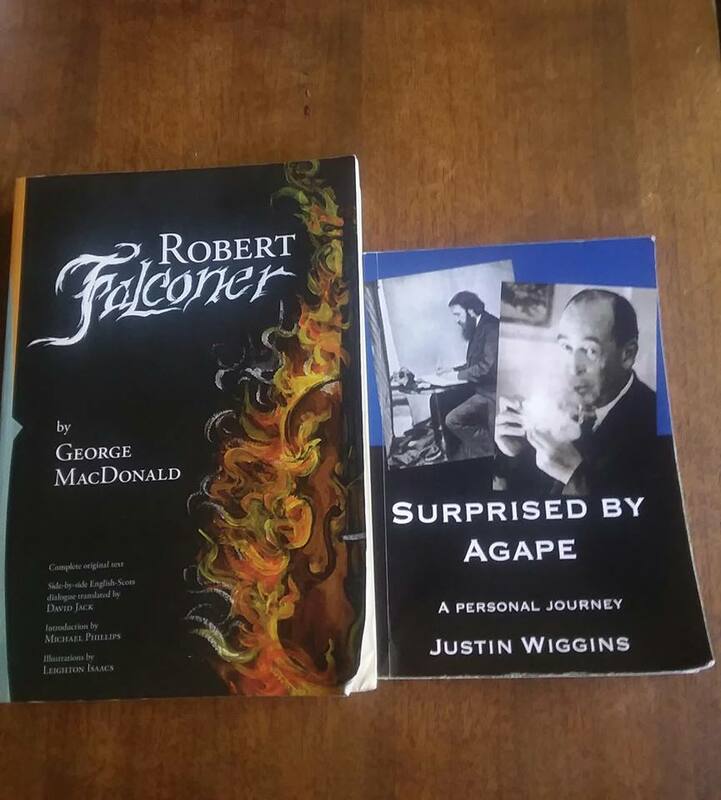 Eventually, through members of the George MacDonald Society, David Jack started a creative project to translate the Scottish novels of MacDonald into English, beginning with Robert Falconer, which was originally published in 1868. I had no idea that eventually David would sign my copy of it at The Eagle and Child pub in Oxford, England where The Inklings used to meet! My last semester before I graduated with my bachelors in literature from Montreat College in the beautiful mountains of North Carolina, I was able to go on a ten day trip to Oxford, England, which was a dream that become a reality, and I got to meet my friend in person finally, which was grand! The day I finally met David, was a very cold, snowy, and beautiful St. Patrick’s day. We walked the streets of Oxford, England, went to a Subway, a charity shop, a few bookstores, had dinner at The Mitre (another Inklings favorite), and one of the highlights of that day was when David and I both went to The Eagle and Child pub. David and I sat in the same room where C.S.Lewis, J.R.R.Tolkien, Warnie Lewis, Charles Williams, Hugo Dyson, Owen Barfield, and other members of their literary group would get together to talk nonsense, literature, theology, and read aloud from some of their works over beer, cider, tea, and pipe tobacco. I will always remember those golden hours of laughs and good conversation. I look back in retrospect on that experience with great joy! Since then, David has gone on to publish Castle Warlock and Sir Gibbie, which have both been endorsed by my friend Douglas Gresham, C.S. Lewis’s stepson, and my book Surprised by Agape has continued to connect with people and do well. It is amazing to me that through a shared appreciation for the writings of George MacDonald and C. S. Lewis, books were published that have connected with people, and a great bond of friendship was created between a Scotsman and an American from North Carolina, which continues to grow. Friendship is one of the great joys of this life!